Free up some room and design your living space with the Sonax Wall Mount Collection. The LM-1230 is a Motion, Tilt and Swivel Wall Mount that accommodates most flat panel TVs from 10" to 32". The motion extensible arm stretches up to 15" for your convenience and comfort. Tilt and swivel up or down 15, right or left 180 to find the perfect angle to enjoy your space. Utilize the cable management system to hide your unsightly wires. The heavy gauge metal construction supports up to 44 lbs. Bring home this Wall Mount and consider complimenting it with contemporary furniture by Sonax. Adjustable Motion Arm up to 15"
CJ Tech full motion TV wall mount. Fits most flat panel TV's from 32 inch - 65 inch and holds up to 99 lbs. Up to 180 degrees of swivel and 15 degrees of tilt, enjoy viewing your favorite shows from anywhere in the room with the full motion capabilities of CJ Tech's TV mounts. Mount Your TV with ease using the built in level to optimize your viewing experience. This CJ Tech mount spans 2 studs for an excellent footing so you know your TV is securely fastened. 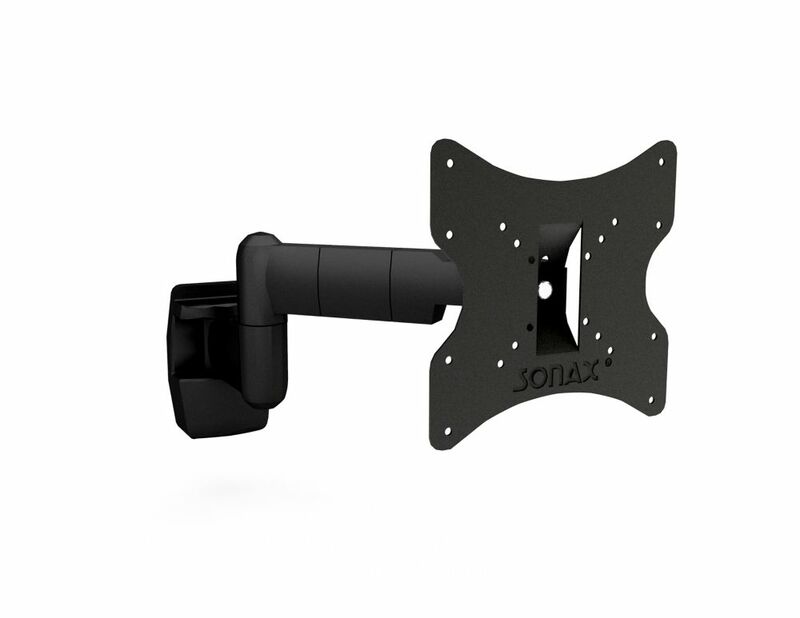 LM-1230 TV Motion Wall Mount for 10" - 32" TVs Free up some room and design your living space with the Sonax Wall Mount Collection. The LM-1230 is a Motion, Tilt and Swivel Wall Mount that accommodates most flat panel TVs from 10" to 32". The motion extensible arm stretches up to 15" for your convenience and comfort. Tilt and swivel up or down 15, right or left 180 to find the perfect angle to enjoy your space. Utilize the cable management system to hide your unsightly wires. The heavy gauge metal construction supports up to 44 lbs. Bring home this Wall Mount and consider complimenting it with contemporary furniture by Sonax.